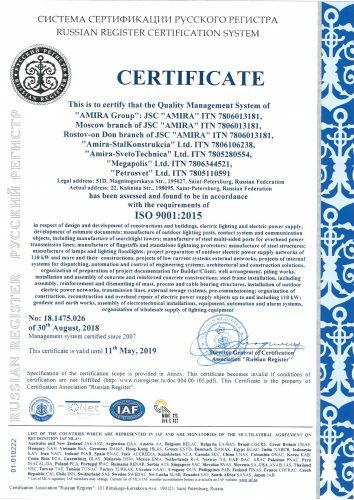 All companies in the group AMIRA confirm their compliance for new requirements of International system of quality management – ISO 9001:2015. JSC AMIRA uses the quality management system since 2006. All of its variations were implemented and this process is continues. The quality of AMIRA’s production is the main stream of company’s development. The new standard ISO was gradually introduced into the work of the company. It is more oriented on factors which are influencing on the strategy development of the company. Because the quality of the manufacturing products depend on it. The risk assessment becomes the main chapter in the standard. The requirements concerns full of production chain, because each one of them can influence on the product’s quality. That’s why the check for confirming to the compliance for new requirements of ISO standard was in all companies of group AMIRA. As a result JSC AMIRA has a new certificate.